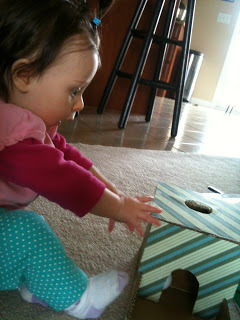 This photo characterizes Abigail’s new phase…wanting to touch things! I am actually excited about this phase and not upset because I know that it means she is learning like crazy! We are doing a new activity that she’s ready for and I see the wheels turning. I agree and use most of the Montessori teaching style. They have activities to do with your child starting from birth. 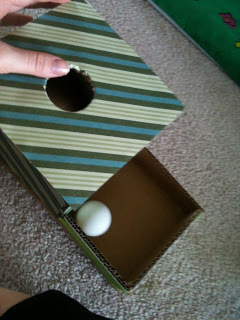 This one involves a box. Instead of buying the one they offer for $50, I made one from scrap cardboard and paper I had for FREE. 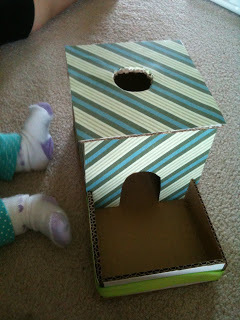 Here’s the box I made. 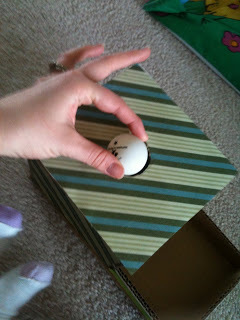 You use a ping pong ball and put it in the hole. They it comes out the hole. The goal is for her to do it herself. She is doing well with holding the ball and she’s put it in the hole 2 times on her own. 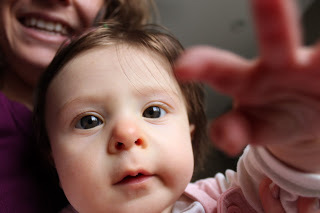 It’s so good for the pincer grip (thumb and forefinger) and for her to learn how things work. I love my girl and we’re having fun!!!! Hi! Found your blog through mutual friends. We used to attend RVC and I think our husbands might know each other. Just wanted to let you know that there is a public Montessori school in SB now. Our kids attend and we have been super happy. I know that is a few years off, but just wanted to give you a heads up! You blog is great! Thanks Shell!!! My mom works at a Montessori school in Elkhart..I am planning to homeschool with my mom's help! Thanks for letting me know!